As I enter into my fifth month as a full on plant based food eater (or dare I say the V-word – vegan?? ), I thought I would put down my thoughts around my experience so far. Let me first be clear, and that is that I absolutely LOVE my new lifestyle change, and I enter into the line of other vegans who have said “I wish I had done this sooner!”. I feel lighter, have more energy, my mood is brighter, my skin is glowing and I think I even smell better! 🙂 It really is an eye opening experience, which I liken to a spiritual one; it’s not just about the food or my health, it’s about finding the perfect way to live for me, not causing harm to any other living beings. While I started my first week with eating some select seafood and eggs, I quickly decided I wanted to abandon these food groups too, and not eat anything that contained animal products. Believe me when I said, this is the easiest change I have ever done. It’s not like looking at a tub of ice cream or a piece of chocolate (or even a bottle of wine) where you give yourself the option of “maybe I’ll just have a bite” – my conviction is so strong I would never even consider eating anything with animal products in it anymore. Of course, from a figure athlete standpoint, this is fabulous for me, because most candy, ice cream and junk food contain either milk or eggs or gelatin (ground up meat bones – yum!) so the temptation that was there before, no longer exists. Up until this past week, the meal that was most difficult for me to adjust to was breakfast. I always have eaten egg whites in the morning, either just plain or in a vegetable omelet. I loved eggs in general, and found this food to be the most difficult to give up (not cheese, as you may expect!). They seem so versatile, can be added into anything and there is no true substitute for it yet. That is, until recently when I found out how incredibly full of horrible ingredients eggs are, being filled with antibiotics and prone to diseases like avian flu. In a recent New York Magazine article by Rebecca Flint Marx, it was mentioned that there are 1.8 trillion eggs being laid every year, and 99% come from places that if people knew about them, would throw up in their mouth. Hens are cruelly packed into teeny sized boxed rooms, that are being treated with massive amounts of pesticides and fertilizers. Besides the ethical quandaries of the egg industry, getting protein from animals is horribly inefficient and also is a big contributor to the climate change. Slice the tofu into approximately one inch cubes. Then, using either your hands or a fork, crumble it slightly. 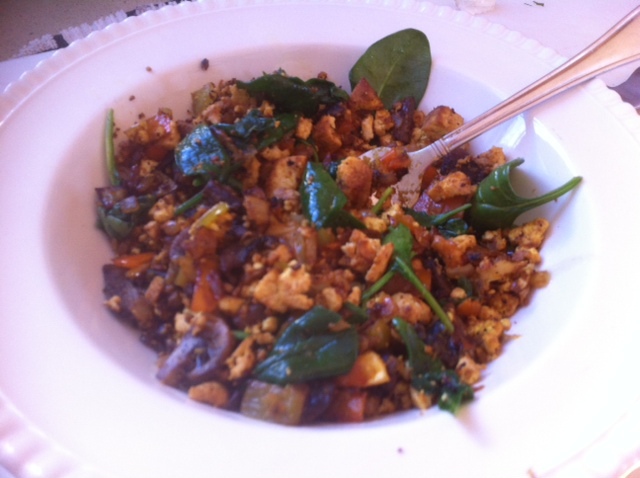 Sautee onion, pepper, mushrooms and crumbled tofu in oil for 3-5 minutes, stirring often. Add remaining ingredients, reduce heat to medium and allow to cook 5-7 more minutes, stirring frequently. Throw in your greens and stir until wilted. Serve topped with hot sauce and if you want- wrap in a corn tortilla. Yummy to the nth degree! !